Objective To synthesise the evidence on the overall and differential effects of interventions based on diet and physical activity during pregnancy, primarily on gestational weight gain and maternal and offspring composite outcomes, according to women’s body mass index, age, parity, ethnicity, and pre-existing medical condition; and secondarily on individual complications. Design Systematic review and meta-analysis of individual participant data (IPD). Data sources Major electronic databases from inception to February 2017 without language restrictions. Eligibility criteria for selecting studies Randomised trials on diet and physical activity based interventions in pregnancy. Data synthesis Statistical models accounted for clustering of participants within trials and heterogeneity across trials leading to summary mean differences or odds ratios with 95% confidence intervals for the effects overall, and in subgroups (interactions). Results IPD were obtained from 36 randomised trials (12 526 women). Less weight gain occurred in the intervention group than control group (mean difference −0.70 kg, 95% confidence interval −0.92 to −0.48 kg, I2=14.1%; 33 studies, 9320 women). Although summary effect estimates favoured the intervention, the reductions in maternal (odds ratio 0.90, 95% confidence interval 0.79 to 1.03, I2=26.7%; 24 studies, 8852 women) and offspring (0.94, 0.83 to 1.08, I2=0%; 18 studies, 7981 women) composite outcomes were not statistically significant. No evidence was found of differential intervention effects across subgroups, for either gestational weight gain or composite outcomes. There was strong evidence that interventions reduced the odds of caesarean section (0.91, 0.83 to 0.99, I2=0%; 32 studies, 11 410 women), but not for other individual complications in IPD meta-analysis. When IPD were supplemented with study level data from studies that did not provide IPD, the overall effect was similar, with stronger evidence of benefit for gestational diabetes (0.76, 0.65 to 0.89, I2=36.8%; 59 studies, 16 885 women). Conclusion Diet and physical activity based interventions during pregnancy reduce gestational weight gain and lower the odds of caesarean section. There is no evidence that effects differ across subgroups of women. We undertook an individual participant data (IPD) meta-analysis to assess the effects of diet and physical activity based interventions, primarily on gestational weight gain and on maternal and offspring composite outcomes, in subgroups defined by body mass index (BMI), age, parity, ethnicity, and pre-existing medical condition. Furthermore, we assessed the overall effects, and those of individual interventions (diet, physical activity, mixed), on critically important maternal and offspring complications. In addition to using IPD, we also assessed the impact of incorporating study level data from other studies not providing IPD. We searched the major electronic databases Medline, Embase, Cochrane Database of Systematic Reviews, Database of Abstracts of Reviews of Effects, Cochrane Central Register of Controlled Trials, and Health Technology Assessment Database from October 2013 to March 2015 to update our previous search in this topic for randomised trials on diet and physical activity based interventions in pregnancy.13 The search was further updated in January 2016 and February 2017 to identify new studies. We searched the internet by using general search engines, and contacted researchers in the specialty to identify relevant trials. There were no language restrictions. Web appendix 1 provides details of the search strategy. Two independent researchers (ER and NM, AAM, or EM) selected studies in a two stage process. In the first stage, potential citations were identified. Next, we did a detailed evaluation of the full manuscripts of potential papers and selected articles that fulfilled the eligibility criteria. We included randomised trials that assessed the effects of interventions based on diet, physical activity, and mixed interventions in pregnancy, on maternal and offspring outcomes. We classified complex interventions on diet and physical activity, including those with behavioural change components, as mixed interventions. We excluded studies that only included women with gestational diabetes at baseline, involved animals, reported only non-clinical outcomes, and were published before 1990. The primary outcomes were gestational weight gain, a composite of maternal outcomes, and a composite of offspring outcomes. The secondary outcomes were individual maternal and offspring complications. The components of the composite outcomes were determined by a two round Delphi survey of researchers in this specialty, and were considered to be critically important to clinical practice.24 The maternal composite outcome included gestational diabetes mellitus, hypertensive disorders of pregnancy, preterm delivery, and caesarean section. The offspring composite outcome included stillbirth, small for gestational age fetus, large for gestational age fetus, and admission of the newborn to a neonatal intensive care unit. Establishment of IPD collaborative network and database—We established the International Weight Management in Pregnancy IPD Collaborative Group by contacting researchers of eligible studies.26 A bespoke database was developed, and we requested collaborators for relevant data in any format. We sent three reminders when there was no response. Two independent reviewers assessed the quality of the randomised trials using a risk of bias tool for sequence generation, allocation concealment, blinding, incomplete outcome data, selective outcome reporting, and other potential sources of bias.27 We considered a study to have a high risk of bias if it scored as such in at least one of the following domains: randomisation, allocation concealment, blinding of outcome assessment, or incomplete outcome data; all items should be scored as low risk for a study to be classified as low risk of bias. Two independent reviewers (ER and NM) undertook data extraction at study level for inclusion and exclusion criteria, the characteristics of the intervention, and the reported outcomes. We sought to obtain IPD from relevant studies published until July 2015, which was the endpoint for IPD acquisition, to allow sufficient time for data cleaning, standardisation, and amalgamation of datasets. We also extracted the published study level data for all relevant studies published until February 2017, including those published beyond the individual data acquisition timeline, and those for which IPD were not provided by study authors. We obtained IPD for individual maternal characteristics that were determined a priori, such as BMI, age, parity, ethnicity, socioeconomic status, and pre-existing medical conditions. Continuous variables were kept continuous, but some were also categorised when considered to be clinically useful. These included categorisations based on BMI (normal 18.5-24.9 kg/m2, overweight 25-29.9 kg/m2, obese ≥30 kg/m2) and age (cut-off 20 years). Mother’s ethnicity was classified as white or non-white. We used the mother’s educational status to indicate socioeconomic status: low status if the mother did not complete secondary education to A level, medium if she completed secondary education (A level equivalent), and high if she completed any further higher education. We defined pre-existing medical conditions as diabetes mellitus, early onset of gestational diabetes, or hypertension. We considered participants to be adherent to the intervention based on the following criteria: completion of at least 70% of the intervention protocol, dataset provided information on adherence in a yes or no format, or participant was deemed to be adherent as per the study criteria. We performed range and consistency checks on all IPD and produced summary tables. The randomisation ratio, baseline characteristics, and method of analysis in the IPD dataset were compared with the published information. Any discrepancies, missing data, obvious errors, and inconsistencies between variables or outlying values were queried and rectified as necessary with input from the original authors. To obtain summary estimates (mean difference for gestational weight gain and odds ratios for binary outcomes) and 95% confidence intervals for the intervention effects for each primary outcome we undertook a two stage IPD meta-analysis.21 We assessed the effects across all interventions overall and for individual interventions. A two stage IPD meta-analysis was used to obtain summary estimates of the subgroup effects (interactions) of interest, which compared differential effects of interventions across the primary outcomes. Additionally we evaluated whether there are any differential effects of interventions for individual complications, according to BMI (normal, overweight, obese). All analyses were designed to preserve the intention to treat principle. The first stage of the two stage meta-analysis involved analysing the IPD in each trial separately, to account for the clustering of participants within trials, and to obtain the estimates of interest and their variances. For the cluster randomised trials, we included a random intercept for a unit of randomisation to account for this further clustering. For the outcome of gestational weight gain, we used analysis of covariance in each trial to regress the final weight value against the intervention while adjusting for baseline weight and centres in cluster randomised trials. For maternal and offspring outcomes, we used a logistic regression model for each trial separately, with the intervention as a covariate. We excluded women with confirmed glucose intolerance or a hypertensive disorder at baseline, as defined by the primary authors, in the analysis of composite adverse pregnancy outcomes. To assess potential intervention effect modifiers, we extended the aforementioned models to include interaction terms between participant level covariates and the intervention (ie, treatment-covariate interaction terms). We included studies that did not contribute IPD, by incorporating their extracted study level data within the second stage of the IPD meta-analysis framework, to obtain summary estimates of intervention effects that combined IPD and non-IPD studies. Sensitivity analyses were also performed by excluding studies with high risk of bias, analysing the primary outcomes separately for each intervention type (diet, physical activity, and mixed), excluding participants not adherent to the intervention, by analysing change in BMI instead of weight gain, and excluding maternal weight gain estimates from pregnancies that ended before 37 completed weeks of gestation to avoid systematic differences. Small study effects (potential publication bias) were investigated by using contour enhanced funnel plots alongside visual examination and statistical tests for asymmetry (Egger’s test for continuous outcomes or Peter’s test for binary outcomes).32 We assessed for IPD availability bias by comparing the summary results when including non-IPD studies with those from IPD studies.33 Furthermore, we compared the symmetry of funnel plots before and after inclusion of non-IPD studies. All meta-analyses were undertaken using Stata software version 12.1 (StataCorp, College Station, TX, USA), and statistical significance was considered at the 5% level. No patients were involved in setting the research question or the outcome measures, nor were they involved in developing plans for recruitment, design, or implementation of the study. A patient representative provided an input to the interpretation and writing up of results. There are no plans to disseminate the results of the research to study participants or the relevant patient community. It was not evaluated whether the studies included in the review had any patient involvement. We identified 58 trials published up to June 2015, of which 36 studies (62%) provided individual participant data (IPD),1617343536373839404142434445464748495051525354555657585960616263646566 that accounted for data from 80% of the participants (12 526/15 541); 22 studies (3015 women) did not provide IPD (fig 1).67686970717273747576777879808182838485868788 A further 45 trials (9945 women)8990919293949596979899100101102103104105106107108109110111112113114115116117118119120121122123124125126127128129130131132133 were identified after the IPD acquisition timeline until February 2017. IPD were available from 36 trials in 16 countries. Twenty two studies17343637383941424748515253565758596061626367 were from Europe, four each from North America,44546566 Australia,16434550 and Brazil,35495564 and one study each from Egypt40 and Iran.46 Twenty three IPD studies included women of any body mass index (BMI),3435363738424445464748525455565859606164656667 seven included only obese women,17394041506263 and six included obese and overweight women.164349515357 The interventions included those mainly based on diet (four IPD studies)47616264 or physical activity (16 IPD studies),353637424649505152555859656669 and those based on a mixed approach of diet, physical activity, or behaviour modifying techniques, or all three together (15 IPD studies).161734394041434445485354566063 One study had a three arm design with intervention arms being physical activity only and a mixed approach.57 The web appendix provides the characteristics of all IPD studies, and also those that did not contribute IPD. More than 80% of women in the IPD meta-analyses were of white origin, and at least half were classified as of high socioeconomic status. Around 45% of women were nulliparous, 40% were obese, and a similar proportion was classified as having sedentary status with no exercise at baseline (table 1). IPD were available to assess the effects of interventions on gestational weight gain (33 studies, 9320 women), maternal composite outcomes (24 studies, 8852 women), and offspring composite outcomes (18 studies, 7981 women). The largest IPD were available for the outcome of large for gestational age fetus (34 studies, 12 047 women), followed by preterm delivery (32 studies, 11 676 women), small for gestational age fetus (33 studies, 11 666 women), any caesarean section (32 studies, 11 410 women), hypertensive disorders of pregnancy (22 studies, 9618 women), and gestational diabetes (27 studies, 9427 women). We did not have access to IPD for 51% of all eligible women (12 960/25 486) from 67 studies (fig 1). Overall, trials had a low risk of bias in random sequence generation (71%, 73/103). More than 90% (34/36) of studies that contributed to the IPD were assessed as low risk of bias in this domain compared with 58% (28/67) of the non-IPD studies. Two IPD studies (2/36) and one non-IPD study (3/67) were considered high risk for allocation concealment. Blinding of outcome assessment was appropriate in 44% (16/36) of IPD and 33% (22/67) of non-IPD studies (fig 2). Fewer IPD studies (5/36) were assessed as high risk of bias for incomplete outcome data than non-IPD studies (15/67). Figure 2 shows the summary of the risk of bias estimates for all eligible studies and those that did and did not contribute to IPD. We did not encounter any issues that we were not able to clarify with the IPD contributor during the IPD integrity check. 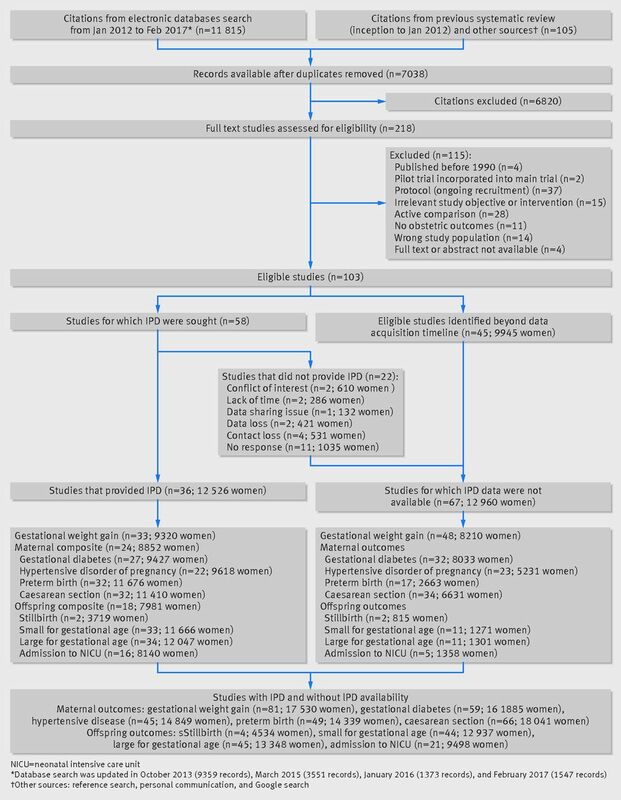 Based on IPD meta-analysis (33 studies, 9320 women), diet and physical activity based interventions resulted in significantly less gestational weight gain compared with control (summary mean difference −0.70 kg, 95% confidence interval −0.92 to −0.48 kg, I2=14.1%), after adjusting for baseline weight and clustering. The approximate 95% prediction interval for the intervention effect in a new setting was −1.24 to −0.16 kg (table 2). No strong evidence was found of a treatment-covariate interaction for baseline BMI when treated as a continuous covariate (−0.02 kg change in intervention effect per one unit increase in BMI, 95% confidence interval −0.08 to 0.04 kg), or when compared as overweight versus normal (−0.11 kg, −0.77 to 0.55 kg), obese versus normal (0.06 kg, −0.90 to 1.01 kg), and obese versus overweight (−0.09 kg, −1.05 to 0.86 kg). We also did not observe evidence of a subgroup effect for age (−0.03 kg per one year increase in age, 95% confidence interval −0.08 to 0.02 kg), parity (0.10 kg change in effect for multiparity versus nulliparity, 95% confidence interval −0.39 to 0.60 kg), ethnicity (0.05 kg change in effect for non-white versus white, 95% confidence interval −1.27 to 1.37 kg), and underlying medical condition (1.51 kg change in effect for women with at least one condition versus none, 95% confidence interval −2.01 to 5.02 kg). The findings were consistent when continuous covariates were analysed as categorical measures based on clinically relevant cut points (table 3). The reduction in gestational weight gain owing to the intervention was consistently observed when the analysis was restricted to studies with low risk of bias (−0.67 kg, 95% confidence interval −0.95 to −0.38 kg; 15 studies, 5585 women), women adherent to the intervention (−0.76 kg, −1.00 to −0.52 kg; 33 studies, 8565 women), women followed up until more than 37 weeks’ gestation (−0.91 kg, −1.17 to −0.66 kg; 28 studies, 5324 women), and for BMI instead of maternal weight as an outcome (−0.30 kg/m2, −0.39 to −0.21 kg/m2; 31 studies, 9238 women). In meta-analysis undertaken by supplementing the IPD with study level data from studies (48 studies, 8210 women) that did not contribute IPD, we observed a larger beneficial intervention effect for weight gain (summary mean difference −1.1 kg; 95% confidence interval −1.46 to −0.74 kg; 81 studies, 17 530 women). The benefit was also consistently observed for individual interventions based on diet, physical activity, or mixed approach (table 2). In the IPD meta-analyses, the summary estimates favoured the intervention group for reduction in odds of maternal (odds ratio 0.90, 95% confidence interval 0.79 to 1.03, I2=26.7%; 24 studies, 8851 women) and offspring composite outcomes (0.94, 0.83 to 1.08, I2=0%; 18 studies, 7981 women), but these were not statistically significant (table 4). We observed no strong evidence of differential subgroup effects for maternal composite outcome according to either baseline BMI (treatment-covariate interaction 1.00, 95% confidence interval 0.98 to 1.02), age (1.01, 0.99 to 1.03), parity (1.03, 0.75 to 1.39), ethnicity (0.93, 0.63 to 1.37), and underlying medical condition (1.44, 0.15 to 13.74) (table 5). A similar lack of differential effect was observed for offspring composite outcome in mothers grouped according to baseline BMI (interaction 0.98, 95% confidence interval 0.95 to 1.00), age (1.01, 0.98 to 1.04), parity (0.94, 0.64 to 1.37), ethnicity (1.12, 0.75 to 1.68), and underlying medical condition (0.58, 0.03 to 9.81) (table 4). The findings did not change for maternal and offspring composite outcomes when BMI and age were analysed as continuous instead of categorical variables. Overall, in the IPD meta-analysis we observed a significant reduction in caesarean section (odds ratio 0.91, 95% confidence interval 0.83 to 0.99, I2=0%; 32 studies, 11 410 women) for interventions compared with routine care. The reduction in other individual outcomes such as gestational diabetes (0.89, 0.72 to 1.10, I2=23.8%; 27 studies, 9427 women), hypertensive disorders of pregnancy (0.95, 0.78 to 1.16, I2=24.2%; 22 studies, 9618 women), and preterm delivery (0.94, 0.78 to 1.13, I2=17.3%; 32 studies, 11 676 women) were not statistically significant in IPD meta-analyses (table 5). We did not observe any differential effect according to baseline BMI category (normal, overweight, obese) for any of the individual maternal outcomes (see web appendix 3). The findings were consistent when study level data from non-IPD studies were meta-analysed with IPD, but with a stronger evidence of benefit for gestational diabetes. The reduction in gestational diabetes (0.76, 0.65 to 0.89, 36.8%; 59 studies, 16 885 women) became significant (table 5). Among individual interventions, those based mainly on physical activity showed a reduction in gestational diabetes in both IPD (odds ratio 0.67, 95% confidence interval 0.46 to 0.99, I2=0%; 10 studies, 2700 women) and in combined (IPD and non-IPD) meta-analyses (0.66, 0.53 to 0.83, I2=0%; 27 studies, 6755 women). While the summary estimates for physical activity based interventions favoured caesarean section (0.82, 0.67 to 1.01, I2=0%; 13 studies, 3046 women) and hypertensive disorders of pregnancy (0.74, 0.42 to 1.33, I2=6.0%; 7 studies, 2565 women) in IPD meta-analyses, the addition of non-IPD studies resulted in stronger evidence of benefit for these complications, with reduction in the respective odds by 17% (0.83, 0.73 to 0.95, I2=0%; 32 studies, 6587 women) and 32% (0.68, 0.49 to 0.93, I2=0%; 20 studies, 5125 women). A strong effect was observed for preterm birth with diet based interventions in both IPD (odds ratio 0.28, 95% confidence interval 0.08 to 0.96, I2=0%; 4 studies, 1344 women) and combined analyses (0.32, 0.14 to 0.70, I2=0%; 7 studies, 1696 women), but the overall sample sizes were relatively small (table 5). There was no evidence of benefit with mixed interventions for any maternal outcomes. No strong evidence was found that interventions had an effect on individual offspring outcomes such as stillbirth (odds ratio 0.81, 95% confidence interval <0.001 to 256.69, I2=0%; 2 studies, 3719 women), small for gestational age fetus (1.06, 0.94 to 1.20, I2=0%; 33 studies, 11 666 women), large for gestational age fetus (0.90, 0.76 to 1.07, I2=38.0%; 34 studies, 12 047 women), and admission to a neonatal intensive care unit (1.01, 0.84 to 1.23, I2=0%; 16 studies, 8140 women) based on the IPD meta-analyses. The significance of the findings did not change when non-IPD studies were added to the IPD meta-analyses (table 5). The numbers of eligible participants for whom data were obtained, effect estimates, and confidence intervals for all above analyses are available from the study authors on request. There was no differential effect for any individual offspring outcome according to the BMI category (see web appendix 3). We found visual and statistical evidence (Egger’s test P=0.04) of small study effects in the contour enhanced funnel plots for the IPD meta-analysis of the overall effect on gestational weight gain. The asymmetry of the plot was not improved by the addition of study level data from non-IPD studies to the meta-analysis. When studies with high risk of bias were excluded from the analysis, the symmetry of the funnel plot improved (Egger’s test P=0.61). We found significant evidence of small study effects for the maternal composite outcome (Peter’s test P=0.04), but not for the offspring composite outcome (P=0.85) (see web appendix 4). Our large, collaborative individual participant data (IPD) meta-analysis confirms that diet and physical activity based interventions in pregnancy reduce gestational weight gain. This beneficial effect was consistently observed irrespective of maternal body mass index (BMI), age, parity, ethnicity, or pre-existing medical condition; and remained when studies at high risk of bias were excluded. The findings are generalisable, with the 95% prediction interval suggesting a beneficial effect on gestational weight gain when the intervention is applied in a new population or setting. There is no strong evidence that interventions reduce the risk of maternal and offspring composite outcomes, with no variation in effect observed across the subgroups. For individual outcomes, interventions reduce caesarean section without a statistically significant reduction in other maternal and offspring complications. The effects of interventions for individual maternal and offspring complications are consistent irrespective of the BMI of the mother. Addition of study level data from non-IPD studies to the IPD meta-analysis increased the precision of estimates, without a change in the direction of effect, and showed additional benefit for gestational diabetes. Among individual interventions, those mainly based on physical activity lowered the odds of gestational diabetes. To our knowledge this is the first IPD meta-analysis to assess the differential effects of diet and physical activity based interventions for important, clinically relevant outcomes, in subgroups of women who were identified a priori. Establishment of the International Weight Management in Pregnancy IPD Collaborative Group facilitated the collaboration of key researchers in this area and provided access to the largest IPD in this specialty. This allowed us to extract data that were not published, with larger sample sizes for outcomes such as preterm birth, small and large for gestational age fetuses, and admission to the neonatal intensive care unit for IPD than for study level meta-analysis. Furthermore, we were able to minimise the heterogeneity in the population by excluding individual women who did not fulfil the inclusion criteria. We compared the quality of studies that contributed to the IPD, which were generally of higher quality than those that did not contribute IPD. Access to IPD provided us with substantially increased power (compared with individual trials) to robustly estimate treatment covariate interactions and to avoid the ecological bias observed in aggregate metaregression of study level covariates.1921 It also allowed us to adjust for baseline weight using analysis of covariance in each trial,134 which is the best approach to analysing continuous outcomes,135 although rarely used in individual trials. Our reporting of 95% prediction intervals for the overall and differential effects of interventions across subgroups allowed us to quantify the range of effects across populations of interest. Owing to the variation in reporting, we were only able to broadly classify the ethnicity of women as white or non-white. Our findings were limited by the smaller number of non-white compared with white mothers. We combined diet based, physical activity based, and mixed approach interventions to provide an overall estimate, and also reported their individual effects.13137 Since more than one clinical outcome is considered to be important to clinical care, we assessed the effects of interventions on maternal and offspring composite outcomes, the individual components of which were identified through a robust Delphi process.24 The varying definitions may have an impact on findings for gestational diabetes and pre-eclampsia, where the cut-offs and the criteria for diagnosis differed. Another limitation is that the majority of our population has a medium to high education status, a factor favouring compliance with interventions. By establishing the International Weight Management in Pregnancy IPD live repository through the support of the individual research teams, we ensured that in addition to the standardisation, data were robustly safeguarded. The continuing growth of the repository is crucial for future research in this area138 and will accelerate update of the meta-analysis for the various relevant outcomes as new studies are published. We were successful in obtaining individual data from 80% of all participants within the IPD acquisition timeline. While every effort was made to include IPD from the latest studies identified in the updated search, we were limited by the time needed to prepare the IPD datasets, which involved data access, setting up of institutional contracts, cleaning and formatting of accessed data, resolution of queries with individual researchers, and standardisation and merging of the data. This restricted our ability to include studies published after the agreed data acquisition timeline in the IPD meta-analysis. In a high priority area such as obesity and weight gain in pregnancy, the number of published studies has increased rapidly, with at least 10 trials published each year since 2011, and 16 published in 2016. We sought to maximise the information needed to inform the findings by combining study level data from non-IPD studies with the IPD meta-analyses. The conclusions appeared to be robust for nearly all outcomes. Furthermore, the non-availability of IPD from these studies did not appear to contribute to the observed small study effects, since the asymmetry of the funnel plot was not altered when the non-IPD studies were added. Non-IPD studies were also generally at a higher risk of bias. Diet and physical activity based interventions reduce gestational weight gain. We have shown that this beneficial effect is observed in all women irrespective of maternal characteristics. The findings are consistent for any type of intervention, even when restricted to only high quality studies and to women adherent to the intervention, and when non-IPD are added to IPD. Mothers with excess weight gain in pregnancy are at increased risk of postpartum weight retention.139 This increase in interpregnancy BMI may contribute to risks of entering subsequent pregnancies as overweight or obese, with adverse outcomes in subsequent pregnancy.140 Furthermore, this may increase women’s risk of cardiovascular morbidity and mortality in later life.141 Compared with published evidence,13 we identified a smaller reduction in gestational weight gain of 0.7 kg with interventions. The effect of such a reduction in gestational weight gain (compared with routine care) on postpartum weight retention and long term outcomes is not known. Despite the summary effect estimates favouring the interventions for maternal and offspring composite outcomes, these were not statistically significant. Interventions significantly reduced the odds of caesarean section. Previous systematic reviews showed a trend towards reduction in this risk overall, and for individual interventions (diet, physical activity, or mixed approach),13 but were limited by the small sample sizes and paucity of reporting, compared with the 11 000 women included in our IPD meta-analysis. Of the individual interventions, physical activity in pregnancy showed a trend towards reduction in caesarean section in IPD meta-analysis, which became statistically significant with minimal heterogeneity when non-IPD were added. The physical activity component in most studies involved a structured exercise of moderate intensity (eg, aerobic classes or stationary cycling) with resistance training that varied in frequency (see web appendix 5). The relatively small numbers of women in the diet only intervention may have contributed to the imprecision in estimates. Although the direction of effect appeared to favour the intervention for other maternal outcomes, they were not statistically significant. Addition of non-IPD to the IPD meta-analysis resulted in a statistically significant reduction in gestational diabetes. However, unlike our IPD analysis, we were not able to implement the strict inclusion and exclusion criteria, standardise the analysis strategy (eg, adjust for baseline), or ascertain occurrence of outcome in the combined analysis with study level data. Physical activity based interventions statistically significantly reduced the odds of gestational diabetes in IPD meta-analysis, and also when combined with non-IPD. This benefit could be mediated through mechanisms that resulted in improved glycaemic variables and outcomes in type 4 and type 2 diabetes, through increased insulin sensitivity and reduced oxidative stress. Exercise in pregnancy may also have a potential role in preventing hypertensive disorders of pregnancy. The effects of diet and physical activity on maternal and offspring outcomes did not vary according to the BMI of the woman, highlighting the potential benefits for all and not selected groups of mothers. Interventions based on diet showed a reduction in preterm birth, although the analysis included relatively small numbers of women. We did not identify any benefits with interventions in preventing any adverse offspring outcome, despite a sample size that was twofold to threefold more than published data for some outcomes, consistent with previous findings.14 The lack of adverse effects such as small for gestational age and preterm birth with diet and physical activity in pregnancy should reassure mothers who have traditionally been advised not to undertake structured exercise or manage their diet in pregnancy. Currently in the UK, only obese women are offered access to a dietician and specific antenatal classes for advice on diet and lifestyle, to minimise gestational weight gain. Based on our work, it is likely that women of all BMI groups could benefit from specific advice on diet and physical activity for weight gain, and some maternal outcomes. Healthcare professionals should avoid variations in care and lifestyle advice provided to mothers based on ethnicity, age, and underlying medical conditions, as no differential effects were found. Discussions about diet and physical activity in pregnancy, which are delivered as part of antenatal care, should incorporate specific estimates of benefit for caesarean section and gestational weight gain, and the likelihood of preventing gestational diabetes. Mothers should be reassured about the safety of the interventions, particularly on physical activity and structured exercise in pregnancy, by highlighting the benefits and lack of harm. This may improve engagement and compliance with the intervention. Importantly, such interventions in pregnancy could be considered in global efforts to reduce caesarean section in relevant populations. Whether the observed benefit in gestational weight gain with diet and physical activity translates to long term benefits to the mother and child needs to be assessed. Evaluation of any differential effects according to the individual components of the intervention, such as duration, frequency, provider, and setting, on individual outcomes is required to provide detailed recommendations. The effects of these interventions on mothers in low and middle income countries, particularly in those countries with high rates of caesarean section and gestational diabetes, need to be ascertained from large randomised trials. There is a need to develop a harmonised core outcome set for future reporting of clinical trials in this area, to maximise the meaningful interpretation of published data. This is particularly relevant for rare but important outcomes such as shoulder dystocia, birth trauma, and venous thromboembolic events. Diet and physical activity based interventions in pregnancy limit gestational weight gain, with no evidence that this effect differs across subgroups defined by maternal characteristics. The odds for caesarean section are also reduced. We thank all researchers, research nurses, and staff of the participating centres in the trials contributing to this IPD meta-analysis. We thank Erica Harris for her input as a patient group representative. Members of the International Weight Management in Pregnancy (i-WIP) Collaborative Group: Ewelina Rogozińska, doctoral researcher, Nadine Marlin, statistician, Ana Pilar Betrán, medical officer, Arne Astrup, professor, Annick Bogaerts, assistant professor, Jose G Cecatti, professor, Roland Devlieger, associate professor, Jodie M Dodd, professor, Nermeen El Beltagy, associate professor, Fabio Facchinetti, professor, chairman of the unit, Nina RW Geiker, senior researcher, Kym J Guelfi, senior lecturer, Lene AH Haakstad, associate professor, Cheryce L Harrison, research fellow, Hans Hauner, professor, Dorte M Jensen, consultant, assistant professor, Tarja I Kinnunen, lecturer, Janette Khoury, researcher, Riitta Luoto, research director, associate professor, Fionnuala McAuliffe, professor, Narges Motahari, reseaarcher, Siv Mørkved, professor, Julie Owens, professor, María Perales, research fellow, Elisabetta Petrella, medical doctor, Suzanne Phelan, professor, Lucilla Poston, professor, Kathrin Rauh, research fellow, Kristina M Renault, obstetrician, Linda R Sagedal, physician, Kjell Å Salvesen, professor, Garry X Shen, professor, Alexis Shub, obstetrician, senior lecturer, Tânia Scudeller, professor, Fernanda G Surita, associate professor, Signe N Stafne, postdoctoral research fellow, Helena Teede, director, professor, Serena Tonstad, head physician, Mireille NM van Poppel, professor, Christina A Vinter, obstetrician, Ingvild Vistad, consultant, SeonAe Yeo, professor, Julie Dodds, senior research manager, Sally Kerry, reader, Louise Jackson, research fellow, Pelham Barton, reader, Emma Molyneaux, postdoctoral research fellow, Alba A Martin, research fellow, Girish Rayanagoudar, research fellow, Anneloes E Ruifrok, resident, Tracy Roberts, professor, Christianne JM de Groot, professor, Arri Coomarasamy, professor, Ben WJ Mol, professor, Javier Zamora, senior lecturer, Khalid S Khan, professor, Richard D Riley, professor, Shakila Thangaratinam, professor (see web appendix 6). Contributors: ST, RDR, CdG, AER, and SK developed the protocol. JD oversaw the project and drafted the manuscript. ST, ER, and NM conducted the review, drafted the manuscript, and led the project. KSK and BWJM provided input into the development of the protocol and drafting of the initial manuscript. ER, EM, and AAM undertook the literature searches and study selection. AER, ER, ST, EM, and GR acquired IPD. MvP, LP, CAV, FMcA, JMD, JO, RB, MP, JGC, FGS, SY, AB, RD, HT, CLH, LH, GXS, AS, NEB, NMo, JK, STo, RL, TIK, KJG, FF, EP, SP, TS, KR, HH, KMR, LRS, IV, SNS, SM, KAS, DMJ, MvP, AA, and NRWG contributed data to the project and provided input at all stages of the project. ER, GR, and NM mapped the variables in the available datasets. ER and NM cleaned and quality checked data. NM harmonised the data. NM, SK, and RDR conducted the data analysis. TR, LJ, and PB provided input into the protocol. APB provided input into the conduct of study. JZ provided methodological support. KSK, AC, and BWJM were involved in project development and provided input at all stages. All authors critically appraised the final draft of the report. ST is the guarantor. Funding: This study was funded by the National Institute for Health Research (NIHR) Health Technology Assessment) programme (No 12/01/50). The NIHR had no influence on the study design, its conduct, interpretation of study findings, writing of the manuscript; and in the decision to submit the article for publication. Competing interests: All authors have completed the ICMJE uniform disclosure form at www.icmje.org/coi_disclosure.pdf and declare: no support from any organisation for the submitted work. HH reports grants from the German Ministry of Education and Research, the Bavarian Ministry of Agriculture and Nutrition, the Bavarian Ministry of Health, the Helmholtz Center Munich, the Else Kröner-Fresenius Foundation, AOK Bavaria, Amway, and the German Research Foundation outside the submitted work. BWJM reports funding from ObsEva during the conduct of the study. Data sharing: The full dataset or its subset and technical appendix are available from the data custodian (Queen Mary University of London) at smd-iwipdata@qmul.ac.uk. Access to the dataset is regulated by terms and conditions available on request. The presented data are anonymised and risk of identification of individual participants is low. Transparency: The lead author (IER) affirms that the manuscript is an honest, accurate, and transparent account of the study being reported; that no important aspects of the study have been omitted; and that any discrepancies from the study as planned have been explained. England PH. UK prevalence of maternal obesity. 2016. www.noo.org.uk/NOO_about_obesity/maternal_obesity_2015/prevalence (Accessed 23 Aug 2016).
. Maternal and Infant Implications of Excessive Gestational Weight Gain among Obese Pregnant Women. J Endocrinol Diabetes Obes2015;3:8.
. Maternal obesity in the UK: findings from a national project.CMACE, 2010. Khalid K, Thangaratinam S, Coomarasamy A, et al. HTA 09/27/06 Interventions to reduce or prevent obesity in pregnant women: a systematic review. UK/Poland: National Institute for HEalth Research; 2010.
. Improving pregnancy outcome in obese women.National Institute for Health Research, 2008.
. HTA - 12/01/50: Effects of weight management interventions on maternal and fetal outcomes in pregnancy: Individual patient data (IPD) meta analysis of randomised trials and model based economic evaluation.National Institute for Health Research, 2013.
. Diet or exercise, or both, for preventing excessive weight gain in pregnancy. Cochrane Database of Systematic Reviews2015;(6):CD007145.
. Weight management before, during and after pregnancy.National Institute for Health and Clinical Excellence, 2010. Gardosi J FA. GROW calculator v6.7.7. 2016.
. Assessing risk of bias in included studies. In: Higgins JPTGS, ed. Cochrane Handbook for Systematic Reviews of Interventions.John Wiley & Sons, 2008doi:10.1002/9780470712184.ch8.
. Maternal and perinatal effects of hydrotherapy in pregnancy. Rev Bras Ginecol Obstet2003;25:53-9. Yeo S, Neelon V, Weaver M, et al. Regular exercise from 12-22 weeks of pregnancy in women at risk for preeclampsia: A feasibility study. (unpublished).
. Diet effects on the perinatal result of obese pregnant patient[Spanish]. Rev Colomb Obstet Ginecol1994;45:313-6.
. The effect of an ergometric training program on pregnants weight gain and low back pain. Gazzetta Med Ital Arch Sci Med2007;166:209-13.
. Impact of a weight management intervention on pregnancy outcomes among obese women: The Healthy Moms Trial. Am J Obstet Gynecol2013;208:S352doi:10.1016/j.ajog.2012.12.009.
. Effect of a Behavioral Intervention with Cereal Fiber or Resistant Starch on Gestational Weight Gain: A Randomized Clinical Trial. FASEB J2015;29(Suppl 1):117.2.
. Impact of nutrition education on gestational weight gain in obese pregnant women. Am J Obstet Gynecol2014;210:S188doi:10.1016/j.ajog.2013.10.402.
. Effect of recommended physical activity dose on obstetrical, neonatal and maternal metabolic outcomes in pregnant Latina women. Ann Nutr Metab2013;63(Suppl 1):984.
. Daily Weight Monitoring in Pregnancy - A Randomised Controlled Trial. Aust N Z J Obstet Gynaecol2016;56:30-3. Effect of an intensive medically supervised exercise program designed to improve maternal glucose control on gestational weight gain - a randomized controlled trial. Am J Obstet Gynecol2017;(Suppl 34).
. A Randomized Trial on the Effects of Perinatal Education of Overweight Pregnant Women to Prevent Childhood Overweight: the ETOIG study. Eur Soc Paed End, 2015: p1-52.
. MOMFIT: A randomized clinical trial of an intervention to prevent excess gestational weight gain in overweight and obese women. Am J Obstet Gynecol2017;216:S2-3doi:10.1016/j.ajog.2016.11.003.